Dana is the name, Zombie killing is my game. Android users and zombie fans impatiently awaiting the return of The Walking Dead TV series have a new reason to be excited. Skybound LLC, the makers of The Walking Dead: Assault have finally released an Android version of the top-selling mobile game, already available on iOS. Although there is certainly no shortage of zombie themed video games – from Telltale’s excellent The Walking Dead choice-based game to Microsoft Studio’s open world zombie survival RPG, State of Decay – The Walking Dead: Assault is a top-down, RTS style mobile game which is definitely worth checking out and should satiate most of your zombie killing blood lust. The game drops you directly into the first volume (“Days Gone By“) of the original Kirkman storyline, in which Rick awakes in a deserted hospital bed, only to find that the world has completely changed. Along the way, fans of the comic books and TV series will be treated to familiar locations and characters as Rick begins to build his team, blasting and hacking their way from the hospital to Atlanta. Initially you are only able to play as Rick, but as you collect resources, you have the ability to trade them in to unlock other playable characters such as Shane, Carl, Lori, Dale, Glenn and others. Currently only Chapter 1 is available with the purchase of the game, however additional chapters will be released which span the complete storyline, characters and locations of the full series…at an additional cost, of course. The art style of the game is quite beautiful (closely matching the black-and-white aesthetic of the comic books) and players can pinch, twist and zoom the camera around as they navigate Rick and his team through large and intricate environments. I tested the game on my Nexus 10, which ran ultra smooth and experienced zero lag or frame rate issues. The levels are deceptively easy at first and you should have no problem quickly blowing off the heads of any pesky walkers that get in your way. However, as you begin to get into higher levels, the gameplay becomes increasingly and noticeably difficult and simply charging at oncoming zombies as a group is no longer a winning strategy. Each character comes with their own special ability that can help the group, but only for a limited time and after a cool down period before it can be used again…therefore, you have to choose how and when to use them wisely. For instance, Rick’s ability is guaranteed one-kill headshots, Shane’s is the ability to load and fire his shotgun quickly, Glenn can create a helpful distraction and Lori’s allows the group to be cloaked and undetectable for a short time. Movement is very similar to an RTS, in which you can select individual players and move them by double-tapping a location on the screen… alternately, you can also move the entire group by long pressing on a location. Ammo is in short supply and you can find additional drops as you navigate each level and/or kill zombies, but you will quickly find that simply trying to unload your weapons into advancing waves of walkers will leave you with an empty gun and no other option but close quarter melee combat…which puts your team at higher risk of being overrun and injured. 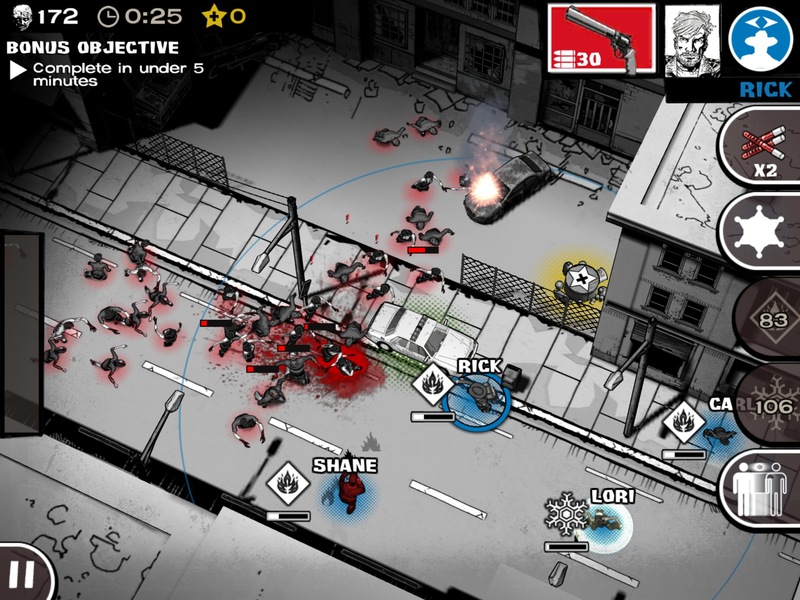 The game allows you to upgrade your group’s abilities over time by trading in resources in order to increase their health, weapon effectiveness and adrenaline (which reduces the cooldown of your special abilities), along with special items like flares that will attract walkers and eventually explode (especially helpful when dealing with large waves of stinky limpers). Overall the game is a blast to play and is a must-buy for fans of the TV show and the comic books. My only complaints are that it can start to get a little repetitive, along with the fact that sometimes it can be difficult to select and move individual characters, especially when you are neck-deep in undead flesh eaters. Your best bet, especially when getting surrounded by a horde of walkers, is to use group formations that take advantage of long and short range weapons. For instance, I place characters with handguns and rifles (long) in the back, and put my characters with shotguns (short) near the front. Also, although you are eventually able to collect enough resources over time to unlock all of the characters, chapters and upgrades…there is a definite sense that the game would like to microtransaction you into bankruptcy. All too often it is easier to simply pay to get ahead faster in the game – and the developers are clearly hoping that you do – but since I already paid $2.99 for the core game, it can get a little irritating when they try to nickel and dime more money out of you. I’m fine with some microtransactions and the developer making money on future chapter releases, but then I recommend that the base game be offered for free. All of these nit-picks aside, The Walking Dead: Assault is a rewarding tactical experience with intuitive controls, great graphics and fun gameplay. Fans of the series will love the faithful recreation of Kirkman’s world – and, as they progress and level higher within the game – will appreciate just how dangerous that world can really be. What do you think of the game? Leave your comments and questions below!